The world is covered with lakes, streams, oceans and rivers of all shapes and sizes from cold to warm, fast moving to lazy, water both fresh and salt is what sustains life on this plant and helps control the global climate. Through the years, water has become something more than what it once was. Once simply life sustaining, water around the world has also become a source of inspiration and adventure and sports such as white water rafting have gained in popularity. 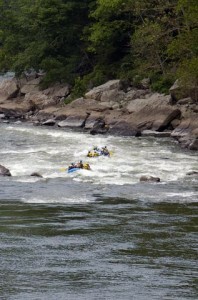 Once only for the dare devil, hundreds of companies now offer rafting opportunities on rivers throughout the United States and around the world. From class I to class VI rivers around the globe now offer the adventurer the opportunity to experience the wilds and explore a feature of the world like never before. Rated on a scale from I to VI with the latter being considered unrunnable, river rafters from beginner to experts may have the opportunity to try their hand at some of the most exciting areas imaginable. Generally rivers from Class I to III are considered alright for the novice while anything above this requires most times that you have some type of training or experience if running them on your own. Outfitters offer trips that last from hours to days and are usually restricted on some rivers by the time of year as well. Top rivers for rafting today include the Snake River in Wyoming, the Rio Grande and the Rio Chama in New Mexico, the Rio Upano in Ecuador and of course, the mighty Colorado including the Grand Canyon Region. Rapids can be found almost anywhere in the world that has a large river within it offering the adventurer plenty of opportunities to take advantage of this wilder side of the world today. Of course, like all adventures, it is important that you know and follow all rules regarding your safety and pay attention as well to the times of year which rafting may or may not be available in your area so you are not unhappily surprised when you get there. If you are up for a real adventure and are ready to try your hand at one of the most exciting ways to explore the world vast water resources, consider white water rafting as one way you can enjoy a more exciting vacation experience. What do you enjoy? Share your adventure stories with us here at Tradewinds Travel Club and review these and other topics that matter to you as a vacationer.